We’ve been interested in picnicking for a few years now; something about packing up a lunch and going somewhere green and lovely to eat it on a blanket on the grass feels so special and nice. We’ve got one of those picnic knapsacks, with all of the cutlery and everything, which we’ve been using as our camp kitchen for years, and we’re building a list of excellent and easily-portable recipes. 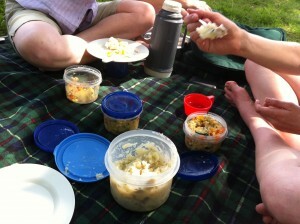 In the midst of anÂ unexpectedlyÂ sweltering May day, we decided to make a few salads and bicycle down to the Trent-Severn Canal, on the bank of Little Lake, to have our first picnic of the year. Â This recipe, one I’d discovered online and altered to suit the ingredients I had on-hand, was a big hit (we also had German Potato Salad and Strawberry Rhubarb Pie). I have to say that you could just do the first step and stop there and have something so good that we barely managed to continue on from there. Only the fact that I’d already chopped up the other ingredients made me continue, and though it was totally delicious and awesome, the plain corn and quinoaÂ combinationÂ would probably make an amazing breakfast – kind ofÂ porridge-y, with a mild sweetness. Almost dessert-y. A little bitÂ decadent. I recommend both! Bring 2 3/4 cups water to boil in a small saucepan and stir in the quinoa and some salt. Return to boil, reduce heat to simmer, cover, and cook until water is absorbed, about 15 minutes. Turn off heat, place corn kernels on top of quinoa, cover pan, and let stand for 15 minutes. Stir corn into quinoa. In a small bowl, whisk together lemon juice, cumin, chili powder, garlic, oil, and salt to taste; set aside. Place quinoa and corn, red pepper, tomato, cucumber, scallions, jalapeno, and cilantro in large bowl. Add dressing and salt to taste; mix until combined. Â Serve immediately or hold briefly at room temperature. It serves about 6, as a side salad, or maybe more if you don’t eat a tonne of it at the first step. Ahem.